I recently attended the Performance and Risk Assessment Community of Practice (P&RA CoP) Annual Technical Exchange Meeting in Las Vegas. This group is part of the effort by the US Department of Energy (DOE) Office of Environmental Management to support risk-informed environmental cleanup and waste management decisions within the DOE complex. GoldSim has been used throughout the DOE complex for many years, and it was nice to see a number of excellent GoldSim applications discussed during the meeting. As a side note, the meeting was held at a very interesting location - the National Atomic Testing Museum - which is definitely worth a visit the next time you are in Las Vegas and need a break from the Strip! The goal of the P&RA CoP is to "foster exchange of information regarding preparation of P&RAs across agencies and practitioners; enhance consistency in the preparation of P&RAs across the Department; and to develop appropriate peer guidance and/or recommendations for P&RAs such that they are based on sound science and are defensible." The meeting was attended by over 50 technical professionals, including staff from the DOE, various national laboratories, regulators, and contractors working at the various DOE sites. A number of GoldSim applications were discussed, including applications at Savannah River, Hanford and the Nevada National Security Site. The presentations are available on the P&RA CoP website. As noted above, the meeting was held at the National Atomic Testing Museum. The museum operates as an affiliate of the Smithsonian Institution. For those of you unfamiliar with the history of US nuclear tests, starting in 1951, 100 atmospheric tests and over 800 underground tests were carried out just north of Las Vegas at the Nevada Test Site (currently referred to as the Nevada National Security Site). The last test took place in 1992. The museum describes the history of the development and testing of nuclear weapons, and gives you a bit of a feeling for the mindset during the height of the Cold War. 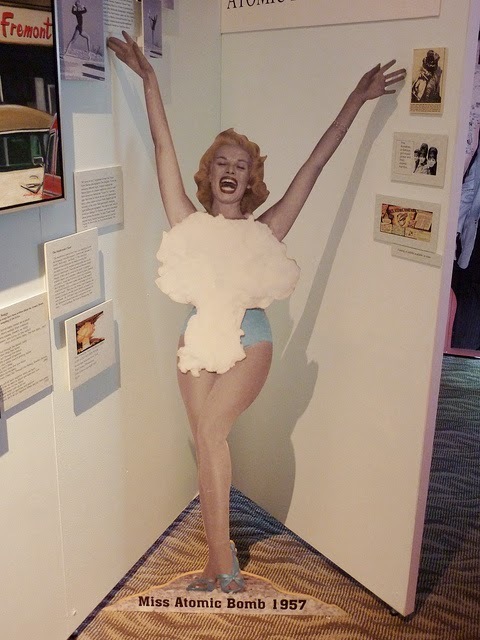 In fact, in retrospect, it was a bit bizarre, as evidenced by the fact that the early atmospheric tests became tourist attractions (viewing the mushroom cloud from Las Vegas), and the photo to the right (Miss Atomic Bomb 1957)! Regardless of how you feel about the wisdom behind the development of these weapons, the museum would be of interest to anyone interested in the complex engineering challenges associated with testing such weapons, as well as the history (and cultural impacts) of the Cold War.